Aaj morkha 15 October 2018 ko Lahore shehr mein 750 wale Prize bond ki 76th draw ki qurra andazi ho rahi hai. Is draw ka pehal inaam 15 laakh rupee hai. Jo sirf aik winner ke lye hai. Dosre winner ke teen prize hani jin ki jeente wali raqam ki amount 05 Lack rupee hain. 750 Prize bond list October 2018 ki third winners list jis ki winning amount 9300 rupee hai wo bhi aj hi sham jo isee page par upload kr di jaye gi. Tamam logon se request hai ke sham 5:00 baje ke baad ap is draw ki mukamal list isi page par dekh sakte hain shukria. 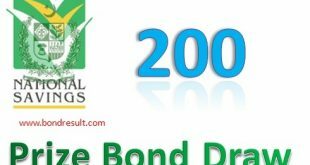 Check some features of 750 Prize bond list October 2018 recent draw going to be held in Lahore city on 15-10-2018 online by National savings of Pakistan Lahore office. You can view Download Draw 76, Rs. 750 Prize Bond List, City Lahore dated 15-10-2018 Results online. 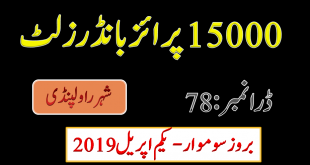 Today 750 Prize bond list October 2018 draw is being announced in Lahore city at 9:00 am and the full draw list of Seventy five Hundred Prize bond October 2018 will be updated here.